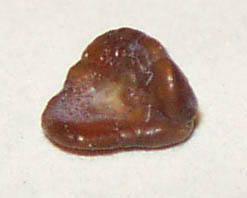 This little 3mm kidney stone caused me hours of the worst pain I have ever experienced. All started as I was about two miles from work Monday: a sharp pain stabbed me in the back and persisted for about 10 minutes when it subsided until I sat down for break about 10AM. The pain intensified at this point for another 10 minutes when it subsided again until about 11 when I left work to head to my doctors office. I reached the spot where the pain began on the drive in to work when I had to get out of the car and almost vomited along the side of the road. Somehow I was able to make it another 10 miles to the nearest hospital where I entered the Emergency Ward and made to wait about another 15 minutes or more to get a pain injection followed by a CAT scan that revealed the 3mm kidney stone. They sent me home that afternoon after a good dose of morphine and Torolac. The pain returned with a vengeance that evening and I returned to the hospital where they admitted me for the night. I was discharged early Tuesday morning and felt like I passed the stone but it had not appeared in their strainer. Slight to severe pain returned that evening but I was able to get some sleep until early Wednesday when the intense pain returned and I ended up back in the ER. They took another X-ray (no CAT scan) and said they saw no stone and after giving me a fair dose of morphine sent me home with a prescription for more pain killers. I never used more than two of the Torolac and avoided the narcotic pills totally this time. I went to work Thursday with only slight tenderness in my kidney and Friday morning I passed the gem pictured above during my morning "P". my 5 miles in after dark. Yes I've been working two jobs which keeps me occupied about 14 hours a day plus another 5-8 on Saturdays. Barely enough time to spend any of the money which is a good thing considering I'm saving up for badly needed home repairs. Check out the photo's taken after destruction of my Living/Dining rooms. The bathroom gets gutted in about a month and thanks to a good friend going to Disney for a week I will have a pot to piss in during the down time. My only complaint about the work schedule is finding time to get my jog three times a week. Here are photo's of the Delaware Canal tow path I am waiting on to be repaired after the 2004 flooding here in Easton. I'm told FEMA has allocated the funds but our politicians haven't agreed on how to spend it yet. Or they have spent it and haven't agreed on their cover story for same. Meanwhile I'm off to the undamaged section of the Lehigh Canal tow path for a Saturday afternoon jog.